Clothing Hacker: I've made 4 Anna's, and 3 of them are dresses! I've made 4 Anna's, and 3 of them are dresses! My (almost 20 year old) daughter is named Anna, so the dress I made for Portland DOR was my 4th Anna, but the 3rd By Hand London Anna. I haven't blogged about either of the other two yet. I made a floor length red and gold one last year for the Banff DOR's Red & White ball. That was the first one I planned to make, but it ended up being my second one. My first was an unplanned make that I ended up needing to wear to a funeral. Both of them were sewn with French seams (the first time I'd ever done that!) and lined bodice. 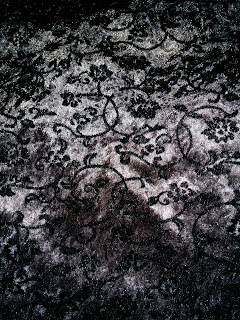 The black dress (lovingly referred to as my Melissa dress) also has a skirt lining that hangs freely. I love the way they fit and, unfortunately I don't have any good photos of either of them on me. 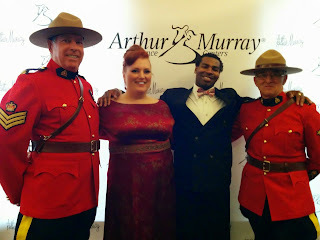 But I do have this one with my dance instructor, Ya-Ya, and some real life Mounties. At some point in the past I purchased some of this interesting looking velour from Morex Fabrics with the intention of making a muslin of the Seamwork Camden that was inexpensive but still pretty enough to wear if it worked out. When it arrived, I discovered that velour is stretchy, which I should have known, but didn't occur to me for some reason. So I instead, for some reason, cut a bodice for an Anna, removing the back zipper seam. 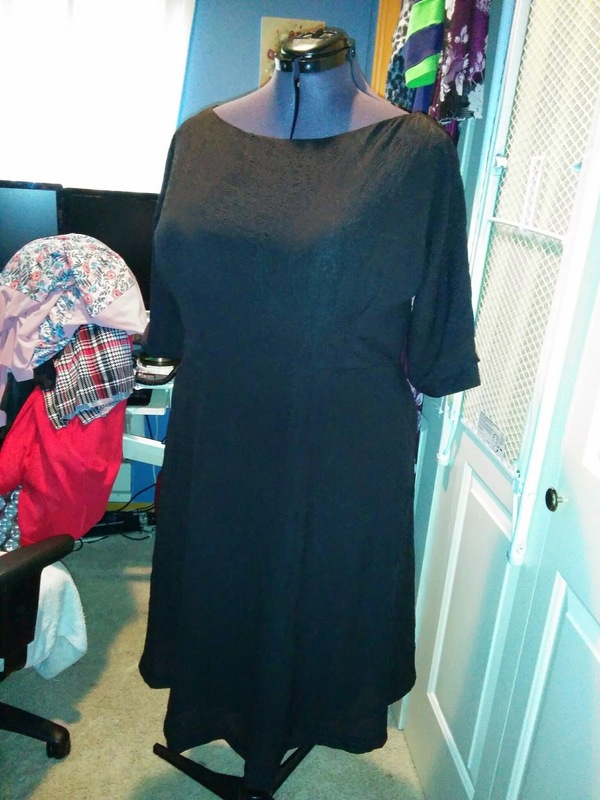 I sewed it up to see how it fit in a stretchy fabric and then I put it aside. 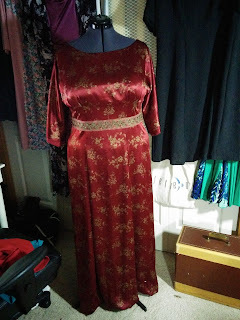 Fast forward a few months and I need at least one more dress for my long weekend of dancing, but I'm having trouble deciding on what to make. So I decided to cut a skater style skirt to attach to this waiting bodice. 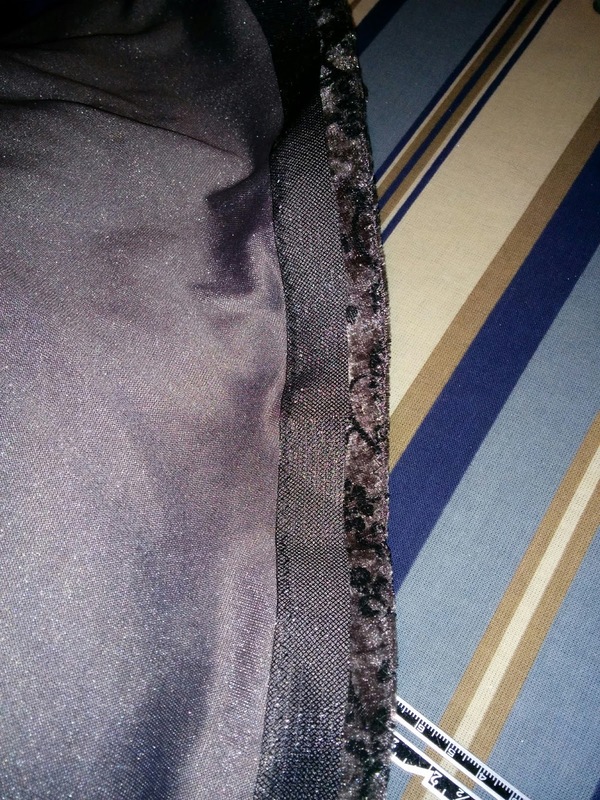 I took the Anna front skirt pieces and lay them out with the center front on the fold and the side front piece overlapping the center front piece by the 5/8" seam allowance. I then placed the skirt piece from my Lady Skater pattern on top for comparison and spread the side front piece away from the center front piece, keeping them connected at the seam line. I did that until the side seams were parallel. The Lady Skater piece was more narrow, but I wanted the waist seam of the Anna skirt to stay the same. I then cut the fabric out around both pieces, lengthening the skirt a bit. (I'm sorry I didn't think to take photos!). Then did the same for the back skirt. I also lined the bodice with some white burnout knit fabric I had from a Girl Charlee bargain lot. I decided to hem the dress with horsehair braid to give the skirt a little bit of extra body. It's pretty subtle, but I really like how it turned out. But I finished my newest Anna in time to take to Portland. I wore it the first night for the bus tour and dinner cruise. Then I took these photos in my hotel room afterward. I got several compliments, which always makes me feel good. Most of the people from my dance studio know I make a lot of my own clothes, so I usually get some, "Did you make this one?" type questions. This dress was really quite simple though and I really like how it looks. 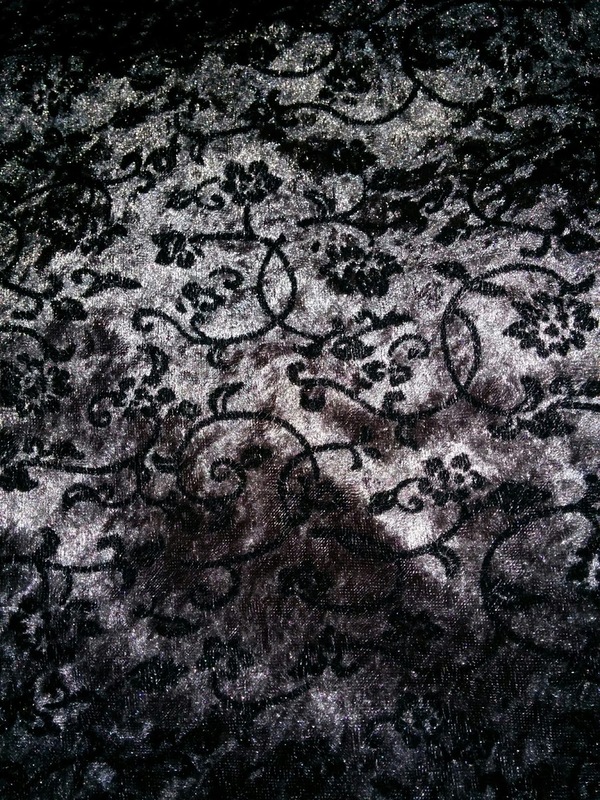 I think I'll try making another in a fabric that suits itself for everyday wear.